Mindfulness is on the rise these days and for good reason. Being mindful throughout your day can set the tone for your entire week. More often than not, most people’s fears and stresses are about things that have already happened or may be happening in the future. We tend to panic so much about things that are actually not happening in our present moment. Mindfulness means being fully aware of the now, living entirely in the moment, and being fully aware of everything around you and everything you’re feeling. This can help reduce stress immensely. It brings you fully into the present moment instead of letting your mind wander into the past or future. I am a firm believer in kick starting mindfulness first thing in the morning. 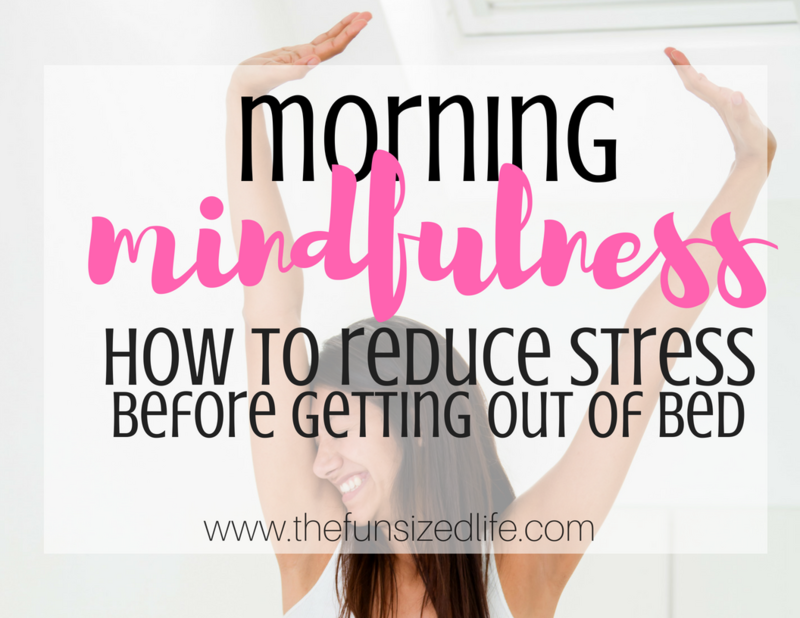 That’s why I compiled this list: Morning Mindfulness: How to Reduce Stress Before Getting out of Bed. It sounds like a lot of work, but really, there are some simple ways to start your day mindfully. The best way to declutter your mind of all it’s worries and stressors is to remind yourself of each and every individual thing you have to be thankful for. Feel free to be as obnoxious with this as you possibly can. Be thankful for the breath you’re breathing, be thankful for your bed, your health, your home. Heck, you can even be thankful for your toothbrush. It seems like such a silly thing, but really, what would life be like without a toothbrush? Pretty nasty. You really dodged a bullet there. Take some deep breaths and with every new thing to be thankful for, take the time to smile. Did you know you can literally trick your brain just by smiling? You could be having the worst day of your life and if you put on a smile, it will slowly start to make your brain believe that you are actually happy as a clam. Just starting your day by saying out loud the things you are thankful for instantly sets the tone for the rest of the day. You could even take it one step further and write down 5-10 things you are grateful for each day. In an article shared by Forbes it is said that by writing down your goals you are 1.2 or 1.4 times more likely to see success with those goals. We may not be talking about goals, but writing down you gratitudes can benefit you because you are seeing reminders every day of what you are thankful for. On top of these external perks, there are other internal benefits to writing down your goals as well. Writing things down consistently sort of re-wires our brains. Taking a moment each morning to write down your gratitudes can drastically improve your outlook on life and even aid in depression. A great way to begin mindfulness is by really being fully aware of your body. To do this, you can start by taking time to feel each part of your body. With your eyes closed, take the time to wiggle your toes. Put your focus only on them. Can you JUST move your toes without incorporating any other part of your foot? Slowly, start rolling your ankles to move your feet. Notice how your feet feel on the sheets. After your ankles, flex your calf muscles then your thighs. Work your way up your entire body paying attention to each individual piece of you. When you have taken the time to be fully aware of each part of your body, let it work together to stretch and squirm and start waking up. As you start flexing your muscles, flex them as long and as hard as you can for 10 seconds and then just let go. Don’t rush this. Go as slowly as you want. When tightening your muscles for 10 seconds, try holding your breath too. This is a mindfulness trick I used to use with kids in my fitness and yoga classes. Using the sound of a chime, bell or gong can really help clear your mind and direct your focus. Apple has a great app called Gong! This app simply places the sound of a gong. Close your eyes, pay attention and quiet your mind, paying attention to the sound of the gong. The sound slowly fades out and when the sound is completely gone take a moment to stretch. Tap the gong again and repeat the same process. Anger. Should You Embrace it? I’m not talking strawberry or raspberry…although that sounds amazing. Have your favorite song or playlist ready and raring to go at the start of each day. Maybe you have one song that will really motivate you for what you have going on this particular day. Let yourself listen to the words, even if you’re dancing in your bed while you do it. Music has literally been proven to reduce stress, calm anxieties and even bring back the memory of those suffering from diseases like Alzheimer’s. Don’t underestimate the power of what positive lyrics are capable of. If you are a coffee lover like me, nothing motivates you quite like the smell of a hot pot of coffee in the morning. So get yours prepped and ready to go! As your alarm clock buzzes in the morning, getting your senses woken up and ready to go is one of the best things you can do. Lay in bed and let your sniffer pay full attention to that smell of fresh coffee flowing through the room. I won’t lie, sometimes I day dream about having a coffee maker on my nightstand. Because I work from home, I wouldn’t even have to get out of bed! Similar to music, they say smell is our strongest sense tied to memory. Have you ever smelled an old cologne and instantly been reminded of a person who used to wear it? Maybe you don’t really like that cologne, but think of a smell that you do love. Something that will set your day off on the right foot. Lastly, and probably most importantly is to remember to just pay attention to your breath. You can lie in bed with your hand on your stomach just paying full attention to your breath going in and going out. This is also a great technique when it comes to falling asleep at night. I get that some morning are more chaotic than others and you may find yourself with no time to listen to a gong or wiggle your toes. No matter what, just take big, long, full deep breaths even if it’s just on your commute to work in the morning. Find your peace and do what you can to start your day off on the right track.